Some of us have phones that we’re not all that thrilled with. They’re alright, but they’re by no means put up on a pretty little pedestal. Then there are others who think they’re phone could do no wrong. Whether it’s the serious iPhone or Blackberry owners, sometimes your phone is the perfect angel. To really show that off you need some angel wings to place on the back. 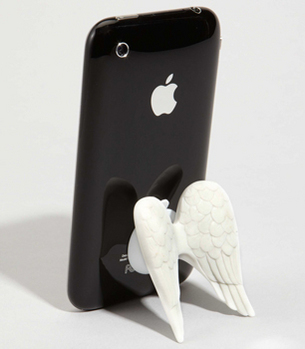 These wings will make your phone look downright heavenly and they even have a use. They will hold up your phone and allow for you to watch all sorts of videos without being forced to hold the phone in your hand. It just suctions to the back of the phone and can be moved for landscape or portrait viewing. You can pick one up for all of $12 through Fred Flare.